This is by far one of my favorite things…and parts of Derby time. DERBY PIE! We have been making this pie for years & I honestly have no idea where I found the recipe. If I do find out I’ll share it! But just know, you can’t have just one piece. Mix flour butter sugar salt until coarse with a few small clumps of butter remain. Add 2 tablespoons of water, mix until it holds together, adding a little water at a time as necessary. You want it to hold together but still be crumbly. Shape into a disk and wrap tightly in plastic wrap until firm, about 1 hour up to 3 days. *Optional is a 1/4 cup bourbon. We don’t make it with bourbon and it is fantastic. Preheat your oven to 350 degrees. Then you want to roll out your dough. This time we decided to make mini pies as well as a full size. For the full 10 inch dish, roll it out larger than the dish and use you fingers to pinch of the top around the edges. I used a little extra dough this year and made a braid that I added to the top before baking. For the minis I highly suggest Demarle cookware! I cut out small rounds of dough and lightly placed onto the muffin cups. When these were done cooking they easily POPPED out of the molds! It’s the best bake ware I’ve used. You barely even have to wash the stuff it cooks so cleanly and perfectly! So once you have your dough in place, in a large mixing bowl, whisk butter, sugars, corn syrup, eggs, vanilla, and bourbon (if your using it) until frothy. Fold in chocolate chips and pecans. Mix. Pour into your pie crust, or spoon into your mini crusts. Cook at 350 for 50-60 minutes (full size) 25-30 for the minis, or until it is set, meaning not jiggly. Slice and serve with some cool whip or ice cream. SO GOOD!!! So if you are looking for a last minute centerpiece, look no further than your local dollar store! 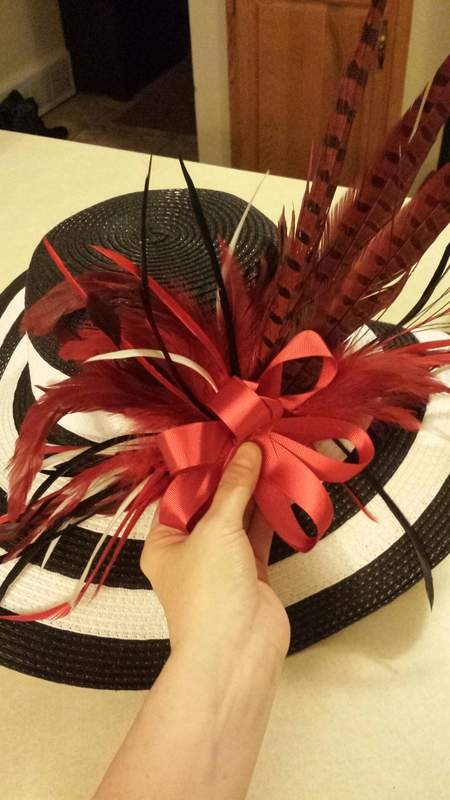 All you need are a few items to make your very own Kentucky Derby Trophies! Easy and cheap DIY trophy centerpieces! The tallest is a plastic gardening pot with a tall vase (upside down) as the base. This one also has the pipe clamps I molded to make handles. The middle size is a ceramic pot with a drinking glass as the base. This one was a trial as far as the handles go. I used pipe cleaners wrapped in washi tape and then spray painted and glued on. The shortest is a ceramic bowl on a candlestick. Once I figured out my combos I started my spray painting. I painted first because I hadn’t quite figured out how I was going to add handles or if at all. However, doing this allowed me to get the perfect color with multiple coats. I got my first coats finished and then hot glued the parts together. This is where I would suggest taking your time. Keep the glue lines smooth and even so you can paint over them. I had most trouble adding the handles but was able to add some layers of glue to smooth out the look and even trim up any drips with scissors after it was dry. Spray paint again. I used several paints, seen below. I just lightly dusted the trophies again paying special attention to cover the glued areas. Mix and mix until you find a color you like. I wanted a vintage tarnished silver look. Layer. Layer. Spray again…and again. Last but not least I added roses to the centers. Bouquets and foam circles & squares from the dollar store of course. So for about $10 I made 3 “Trophies” for my table. Then, I found a white ceramic “trophy” complete with gold roses from a local consignment shop! What a find! Follow my blog for final pictures of my party. I can’t wait to put it all together! 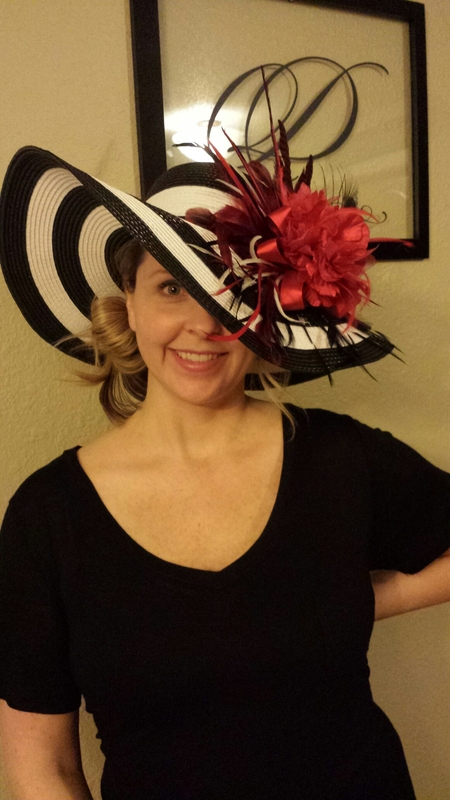 Here are a few more links to make your Derby party a WINNER! I’m sure by now you assume I have oodles of time to sit around and craft but the reality is I do most of my stuff after the kids have gone to bed and hubby has fallen asleep on the couch. What’s a girl to do? This next one came to me while I was working on said crafts one night at the kitchen table. I was looking at my sliding glass door that my son and I had colored on earlier that day. Why couldn’t the windows be part of my decor for parties, namely my Kentucky Derby Party? I printed up some wording that I created and also enlarged a picture of the Twin Spires at Churchill Downs. Oh, and some roses too. I taped them to the opposite side of the door and traced away using the Crayola crayons made for use on the windows. So what do you think of my window art? Have you used these crayons? So this is a continuation of my All Holidays Wreath. I just removed the decoration from my daughters Purple Princess Party wreath and needed something for my Derby party. I found some great looking rose bunches at the Dollar Store. There were 6 or 7 in a bunch for only $1! I also had my decorative nail heads that I use to attach my decoration. First, I pulled the roses from the stems.Then removed the green plastic base from the flower. Next, I needed to remove the small green stem in the center so my nail head would reach. If you’re using longer stick pins you might be able to leave them. Add your nail head to the center of the flower and press onto the wreath. Repeat until all flowers are added. It looked great with just the flowers but i also had a red and neutral burlap bow to add. It just twisted on around the wreath. Here it is! I’m still looking for a small horseshoe to add but I’ll probably end up making one. I’ve been working on some printables for my party and thought I’d share. Here are some menu tents. One set plain and one set with a menu. 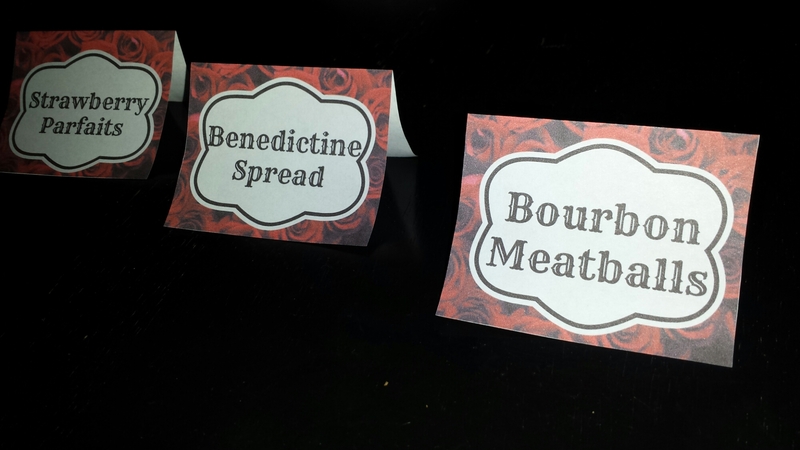 You can find a few of the recipes at the Kentucky Derby Official Site. Be sure to print them on card stock so they stand up well. Below are some print and frame ideas. Always think of other places you could add a touch of decor. Maybe on the bathroom sink or even outside on the deck or patio table. The watering trough sign is perfect next to your drink station. Also, If you are looking for some great stuff for the kids, I found a great site, Coloring Panda, that has cute Derby themed coloring pages you can print and have ready for the pint sized racing fans. Why not put crayons in Mint Juleps cups or spray paint small clay pots silver to hold markers? It seems that my previous post about making a hat was popular, but it was lacking a step-by-step tutorial. 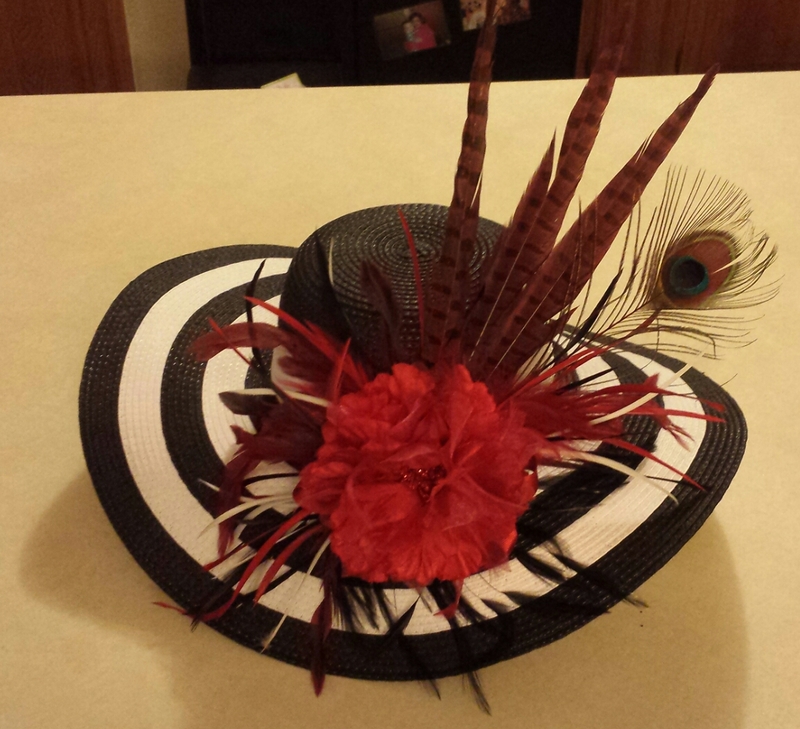 So I thought I’d share how I made this years hat. 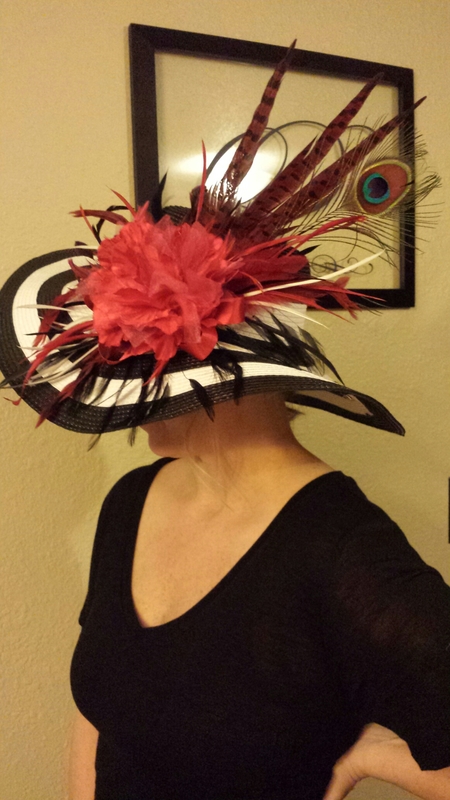 You can easily make a hat that looks like you spent a fortune or had it made. This year I found my hat at Target! 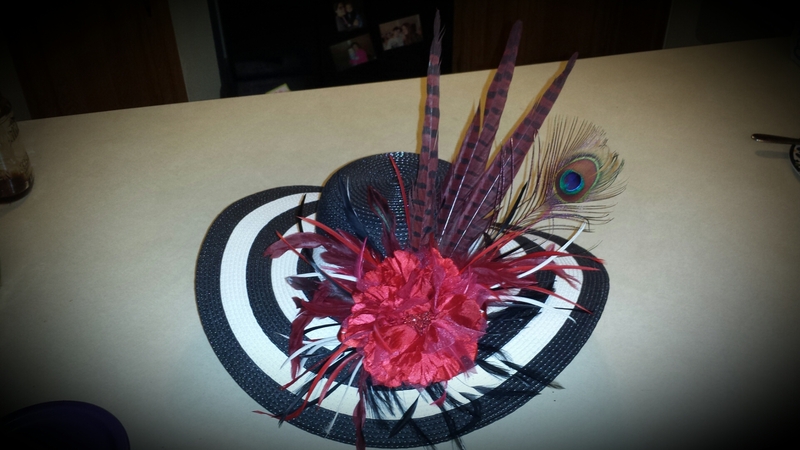 $14.99 for a cute black and white stripe hat. It fit well and had a good shape. I then went to Hobby Lobby, 40% discount coupon in hand, and wandered the store.Go with an open mind. You never know where you will find inspiration. I honestly went thinking I wanted to do big flowers. Then I found feathers. RED feathers. I gathered some that went together, knowing that if I needed more I could always go back. Since I already had red ribbon at home, as well as hot glue, thread, and extra decor, the total I spent at Hobby Lobby was no more than $10. First get comfy in front of a mirror and position and reposition your hat to find the most flattering style. If it has a wire brim you can play with the curves of the brim. I love the dip over one eye. Some prefer to have it sit back away from their face. If your hat is a solid style with out a noticeable front or back, although they usually do, rotate your hat around to see if one side fits better. Once you’ve decided, if the front you are using is different from the true front you might mark it with a safety-pin. So you remember where you plan to put your decoration. 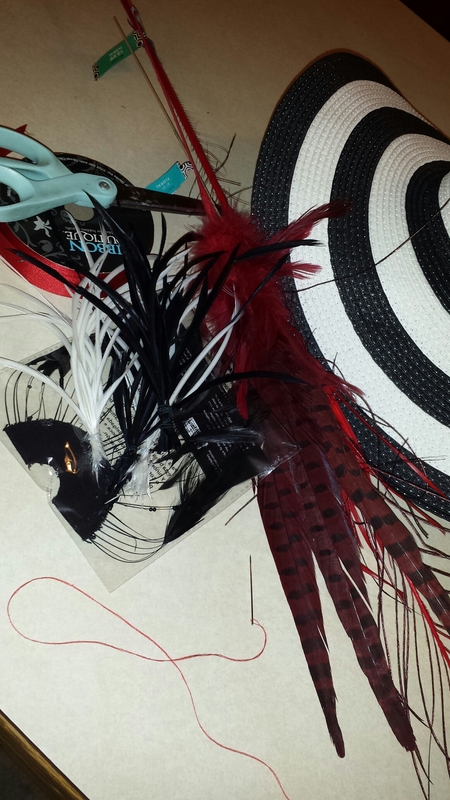 I have the black and white stripe hat, a few large bunches of red feathers, several small bunches of black and white feathers, red ribbon, and a peacock feather that has also been dyed red. 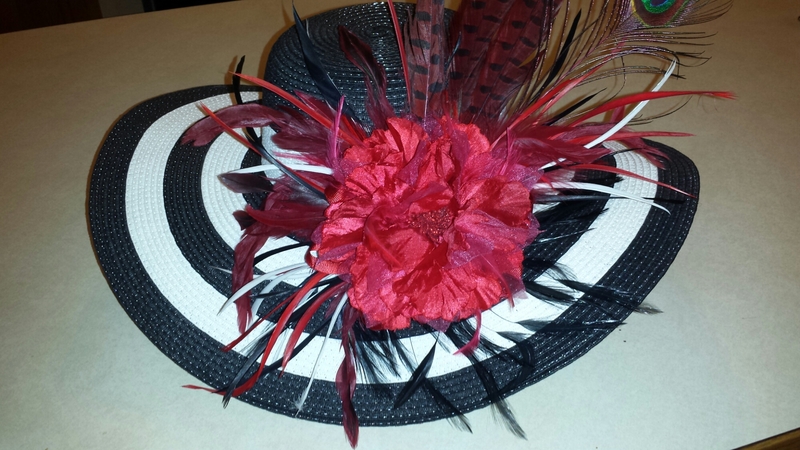 **If you are making a fascinator, all of the same methods apply,however, you may want to use smaller feathers. 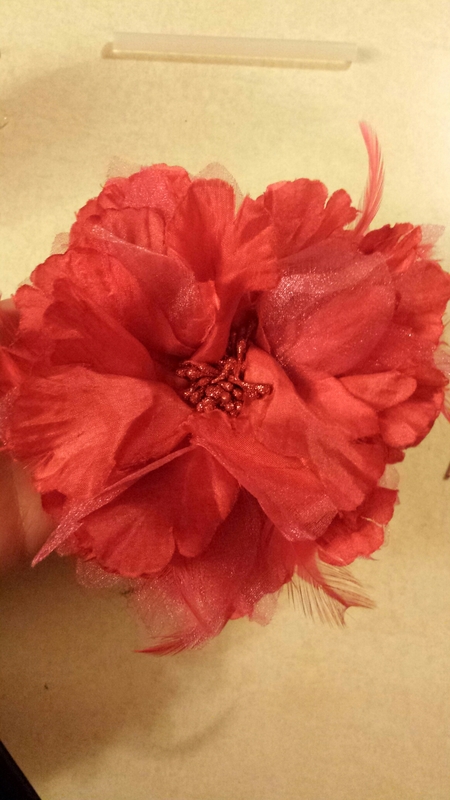 If you are using a headband, cut two circles from felt and hot glue two sides so you can slide the headband through the circle, one felt piece on top to hold your decoration and one on the bottom that sits against your hair. I also have at the ready, a hot glue gun, needle and thread, tape, and scissors. Also, find something you can set your hat on as a stand so you can really work on it with the brim as you need it. I used an upside down clay pot that is in the process of being made into a cake stand. OK, this is the fun part. Just remember that you can always redo, change, alter, or even start over. There is no right or wrong way to do this. Just let the creativity flow. 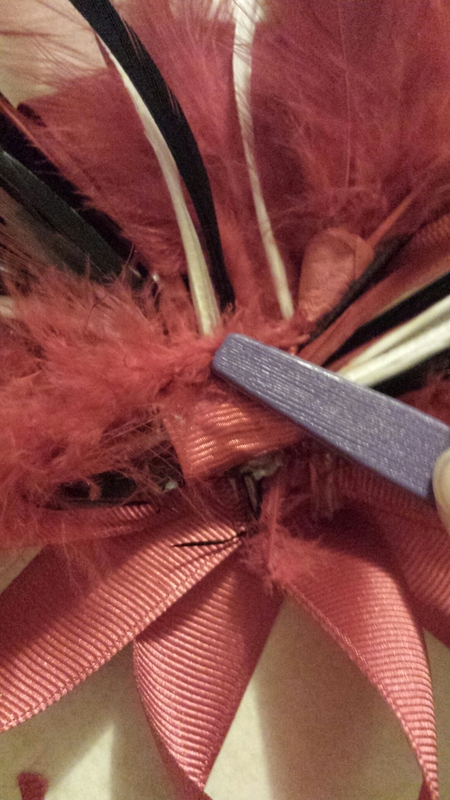 If you want to put a band of ribbon around the crown do this first. You can tack it on with thread if you plan to remove it or hot glue it for a permanent solution. 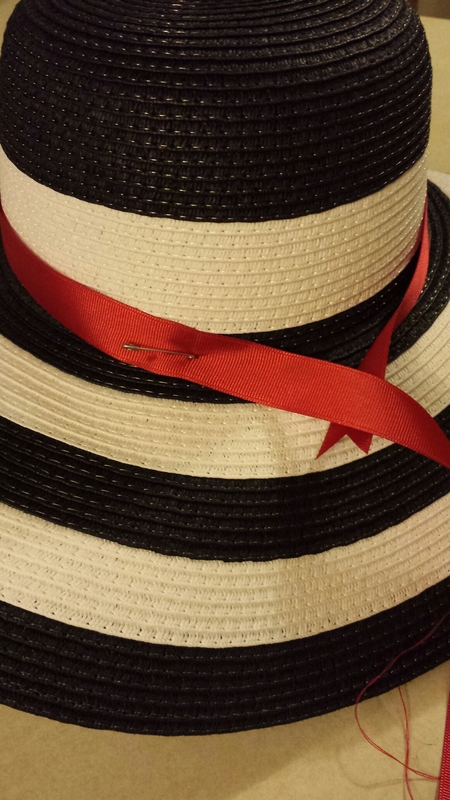 I like to pin/safety-pin it to the hat to hold it in place as I go. After much debate, I decided to do without this year. However, I decided that I wanted to make my decoration removable because I liked the hat so much. 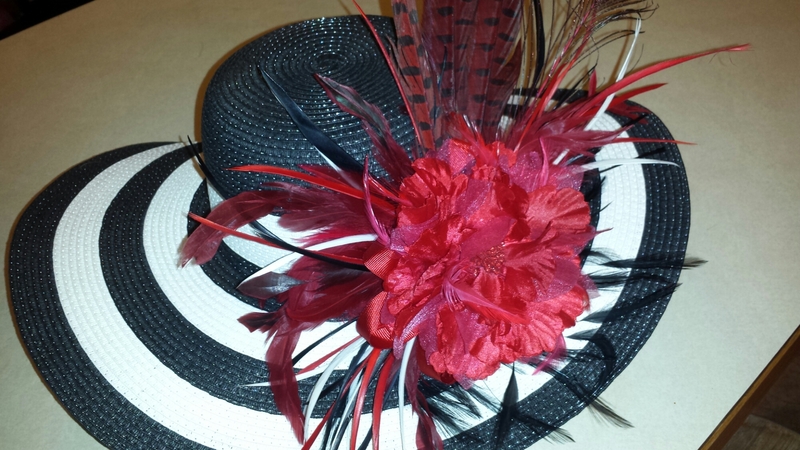 Super great for a summer hat! If you are going to do this you can follow what I did and make a ribbon base (see below) for all that you will glue to it or cut a small piece of felt in the same color as your primary decor or hat color. This is my base: I looped my ribbon around a few times and then attached the loops with thread. 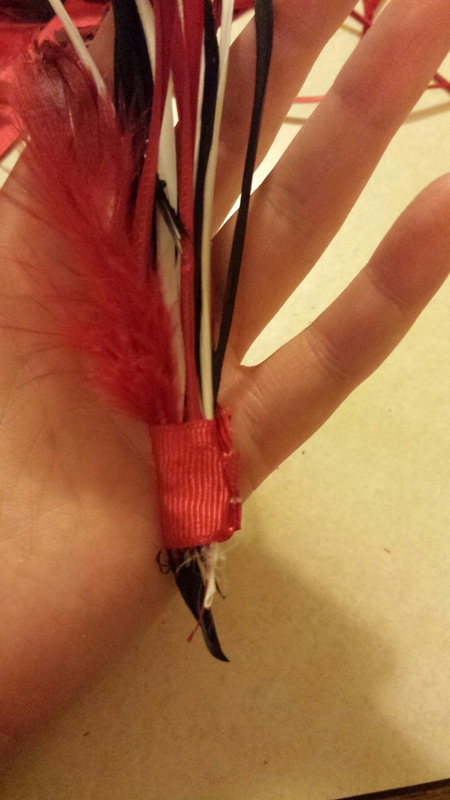 Once I had that together I used hot glue to attach a few more loops with single strands of ribbon. 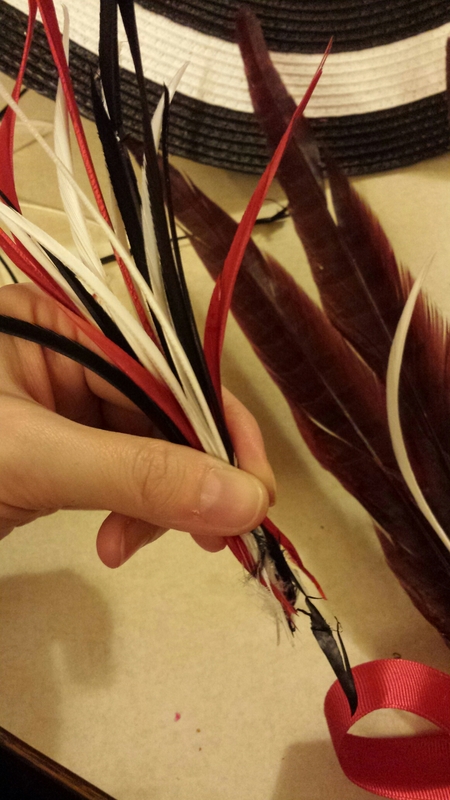 Next, I took apart the feathers to separate the long feathers from the short and to remove the long wire stem. 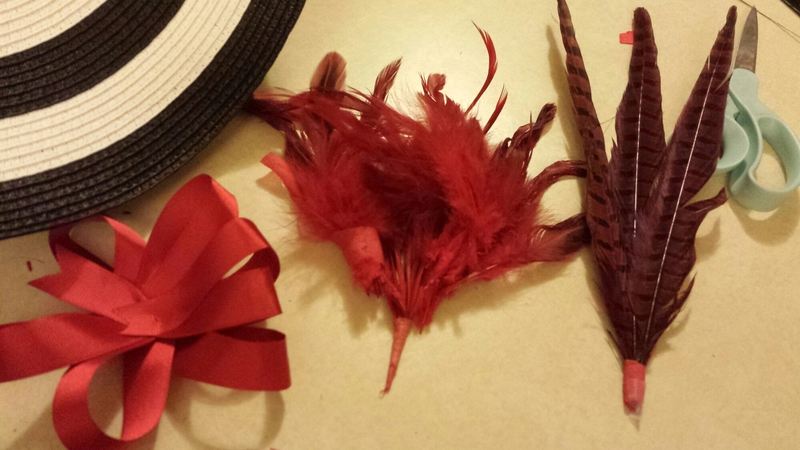 Once I decided the angle on my hat I wanted for the long red feathers I hot glued them to my ribbon base. 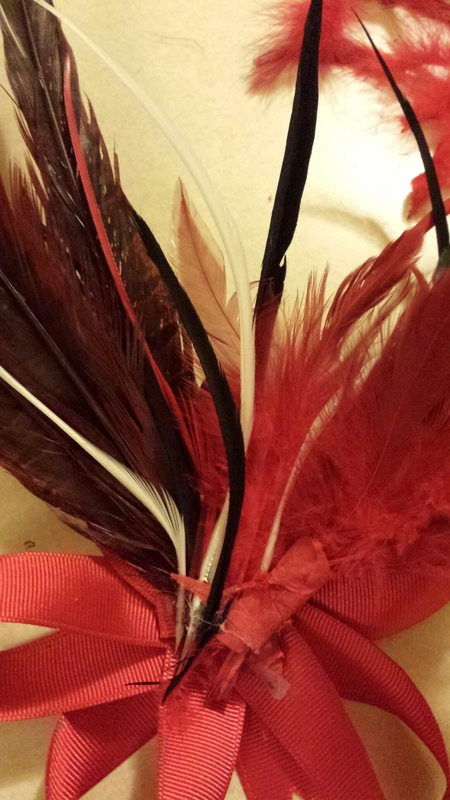 I then attached a few single sprigs of red, white, and black feathers around that with hot glue. 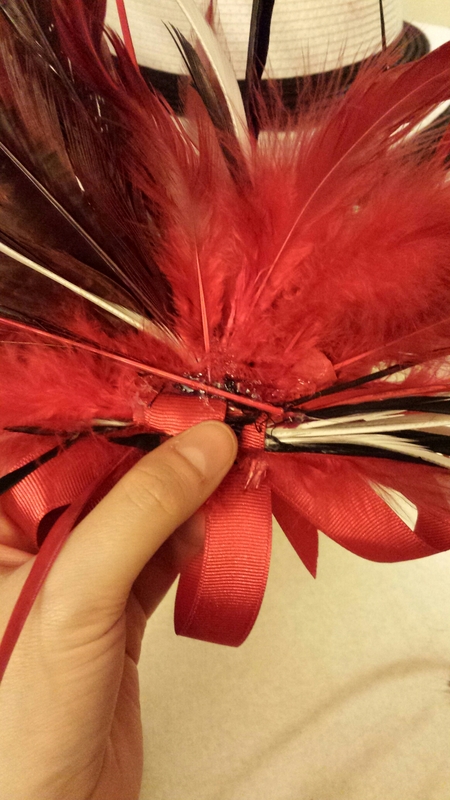 A few times I would group together single strands of feathers and hot glue ribbon around the base to keep them together and to keep my fingers from getting singed…again. 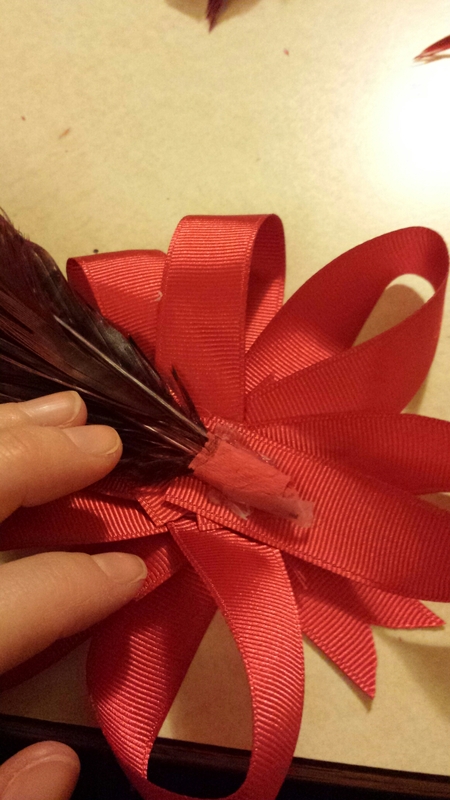 I also used the end of a plastic fork to lightly press down on the feathers as the glue dried. You want to keep following this process until you are happy with the spray of feathers or flowers. It doesn’t have to be even or symmetrical. My final addition was the peacock feather for my boost of luck! 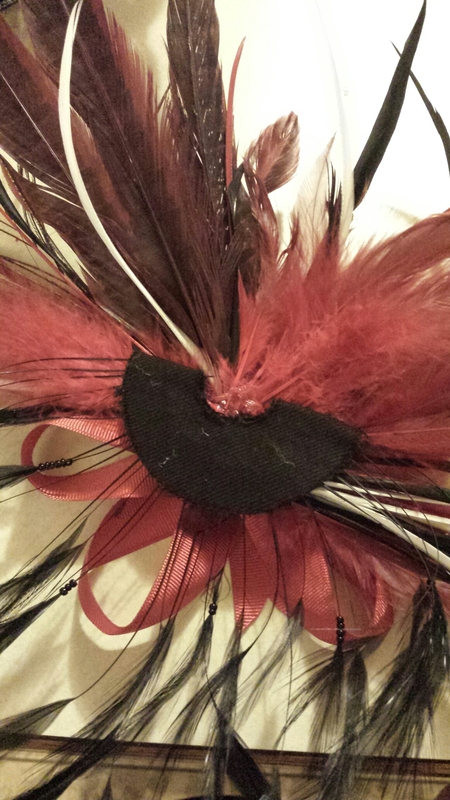 I then added the half-moon of black feathers to the bottom of the ribbon so they would rest on the brim of the hat. I was really liking my finished product, but something about the ribbon just wasn’t sitting well with me. It just needed something more. I think if the ribbon was wider or had pattern I would have liked it more. So I dug through all my brooches and hair clips and brought several to the table. One worked out to give it the WOW factor. It also had a pin on the back as well as a hair elastic. 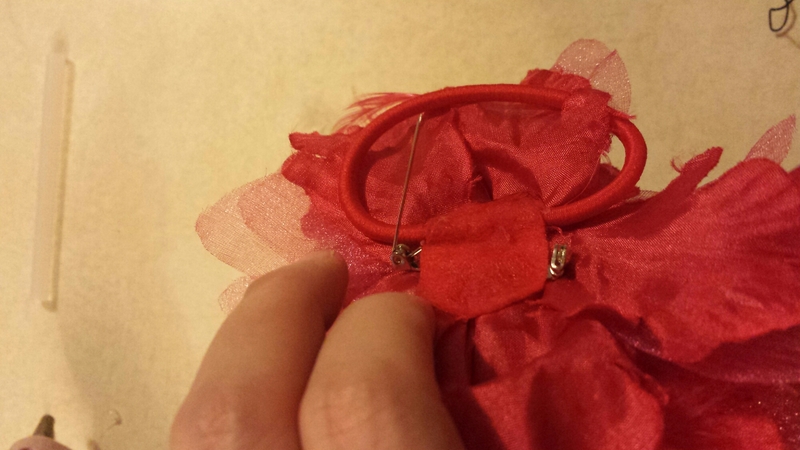 I pinned it on the center of the ribbon and voila! GORGEOUS! How to add the entire decoration to the hat? A safety-pin of course. I just have one holding it in place right now and may add another before May 7th, but it seems secure enough. 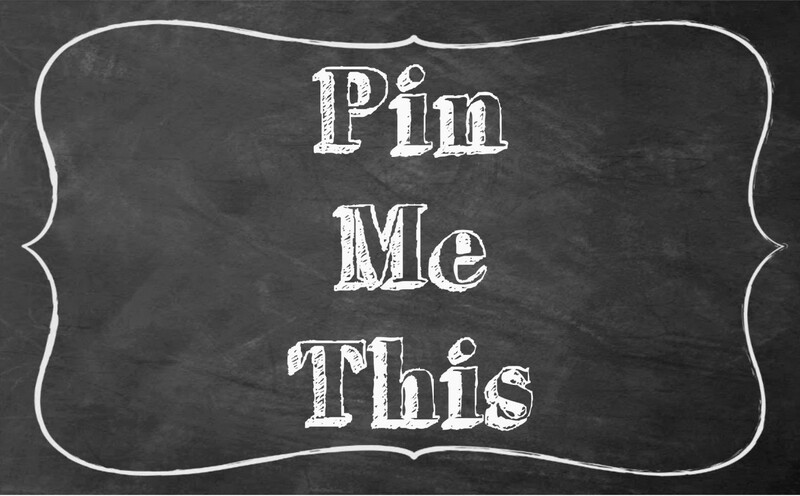 Pin Me This is officially a “.com” and to celebrate we are doing a giveaway on our facebook page. Head over, like our page and like and share our giveaway post for your chance to win this super cute 6″ horse cookie cutter I found on, you guessed it, Pinterest! It is by Ann Clark and sold by Kentucky Restaurant Supply. Winner chosen randomly on April 23rd, the kick off of the Derby Festival! 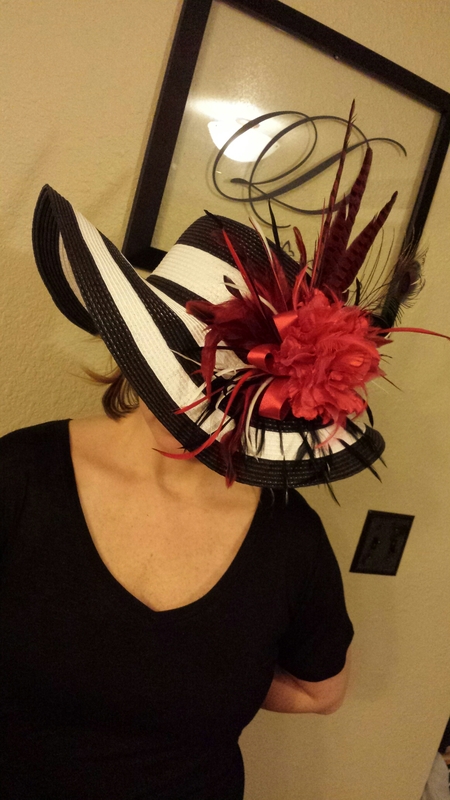 You can also check out my other posts for a Kentucky Derby Party, Making a Hat, Hat Etiquette, and a Tutorial to get started. Just in time for Derby y’all!